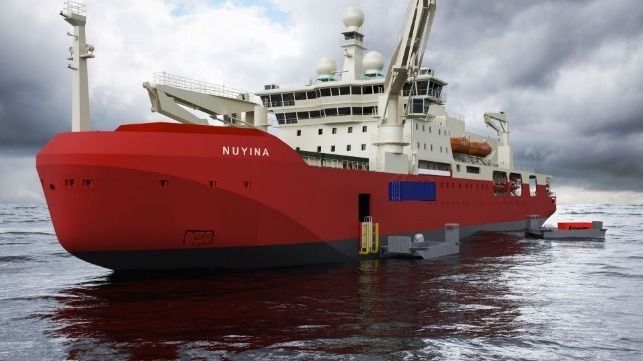 Australia’s new icebreaker, RSV Nuyina, is currently under construction. 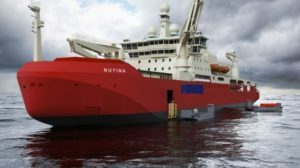 The ship, which will make its maiden voyage to Antarctica in 2020-21, will be the main lifeline to Australia’s three Antarctic research stations and its sub-Antarctic station on Macquarie Island and will support Australia’s leadership role in Antarctic and Southern Ocean scientific research. The ship is also flexible enough to cope with future research and operational demands during its expected 30-year lifetime. The word nuyina, pronounced noy-yee-nah, means ‘southern lights’ in palawa kani – the language spoken by Tasmanian Aborigines today. The name Nuyina, suggested by schoolchildren in a “Name our Icebreaker” competition, recognises the long connection that Tasmanian Aboriginal people have with the southern lights (or aurora australis). The Nuyina is the only ship in the world to have a watertight room or ‘wet well’ to process seawater for krill and other fragile marine organisms, at up to 1800 litres per minute. Other state-of-the-art scientific equipment includes acoustic instruments to map and visualise the sea floor and organisms in the water column, and instruments to measure atmospheric gases, cloud properties, wave heights and ice conditions. A new icebreaker represents a once in a generation investment by the Australian Government and is the centrepiece of the Australian Antarctic Strategy and 20 Year Action Plan launched on 27 April 2016. The $1.9 billion package will cover the design, build and 30 year operational and maintenance lifespan of the icebreaker. It is the single biggest investment in the history of Australia’s Antarctic Program. 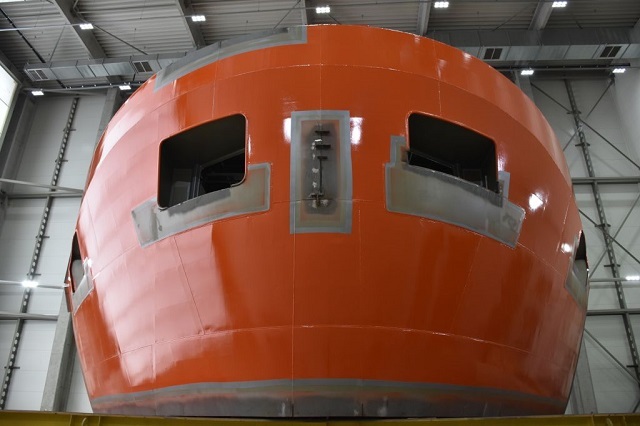 More than 8,600 tons of steel has now been shaped, welded and assembled into the hull of the new icebreaker, equivalent to 48 blue whales or 191,844 large emperor penguins. A few key pieces of the ship’s propulsion system have recently arrived at the Damen Shipyard at Galati, including the propellers, propeller hubs and the sterntubes. 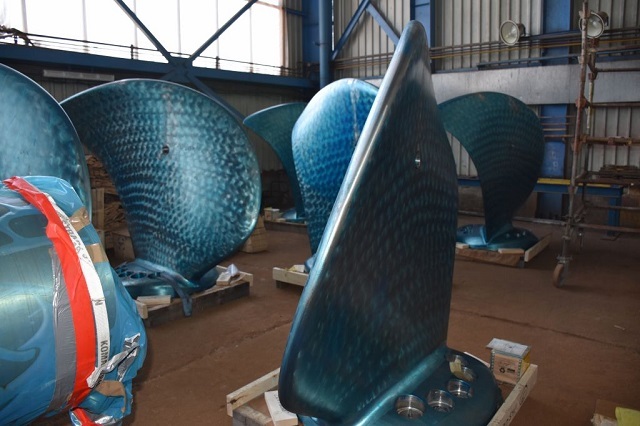 The blades of the propellers covered in a blue protective coating. Each propeller has four blades, made out of stainless steel and weighing about 4.5 tonnes each. 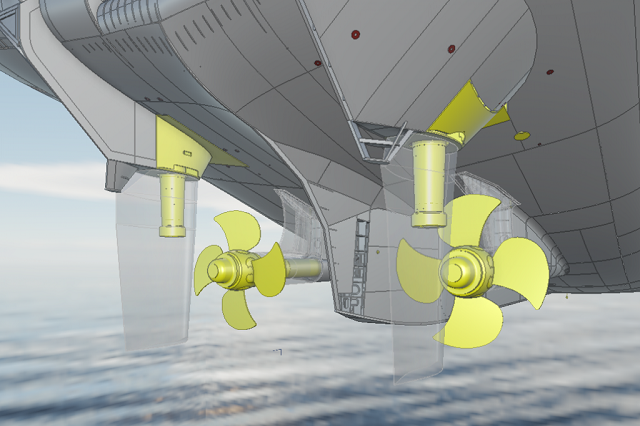 The total diameter of the complete propeller is 5.65m. This is a propeller hub on to which the blades are bolted. The hub is attached to the propeller shaft, which is the first section of the propulsion shaft line that extends all the way from the propeller to one of the two main engines. The propeller hub is made of nickel, aluminium and bronze and is 1.94 m diameter and weighs almost 21 tonnes, without propeller blades or oil inside. 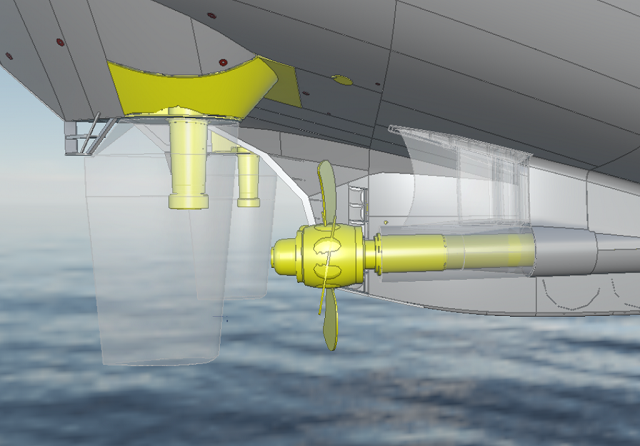 During operation the hub is filled with oil to actuate the variable pitch of the propeller. 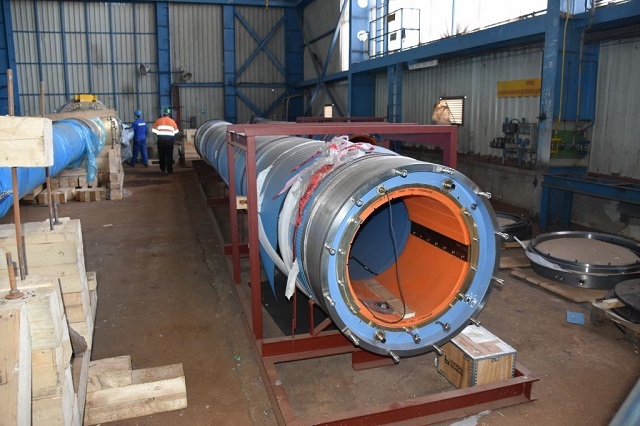 The propeller shaft is installed within this sterntube, which is 12.7 m long and fits inside the gondola (see Anchors, ice knives and thrusters). The sterntube is an important part of the ship’s propulsion system because it enables the rotating propeller shaft to pass through the hull without water leaking into the ship. 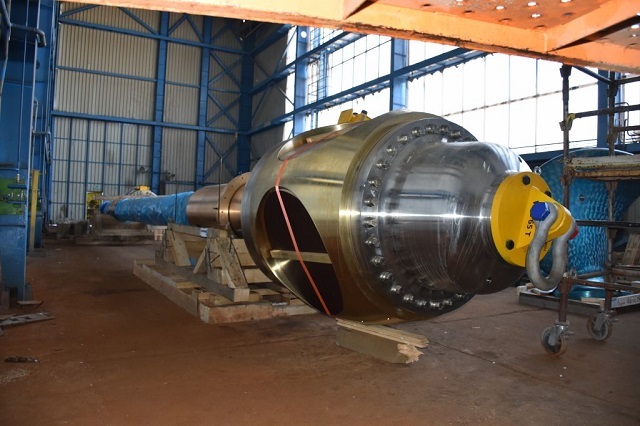 The sterntube will have a shaft seal fitted at each end and will be filled with fresh water that will be maintained at a pressure slightly higher than the surrounding sea water. This will assist the sealing effectiveness of the outer shaft seal. The water in the sterntube will also act as lubricant for the synthetic sterntube bearings. A sneak peek at the colour of the new ship: International Orange. Graphical representations of the propellers, propeller hubs, and propeller shafts inside their sterntubes, once installed.